Did you know that Poplar in east London is named after the poplar tree, yet no native poplars grow there any more? That tantalising fact is the starting point for one of the best non-fiction books about London we've read in a long time. Ghost Trees goes in search of the missing poplars, but also spreads its branches to encompass the other plants and animals that call the East End home. Ghost Trees is a tricky book to pin down. Part social history, part natural history, the narrative flips with ease between human stories and botanical marvels. Like a rogue dandelion pushing up through a pavement crack, it finds itself between genres. What holds it together is Bob Gilbert's gifted style of writing. Simple, clear but hilarious storytelling helps to make this secret life of trees an unlikely page-turner. This is a man who calls a spade a spade, then uses it to dig up all manner of peculiar tales without ever slipping into clumsy metaphors — like I've done three times already in this review. Bob Gilbert shows, beyond doubt, why the ink cap mushroom is so named. 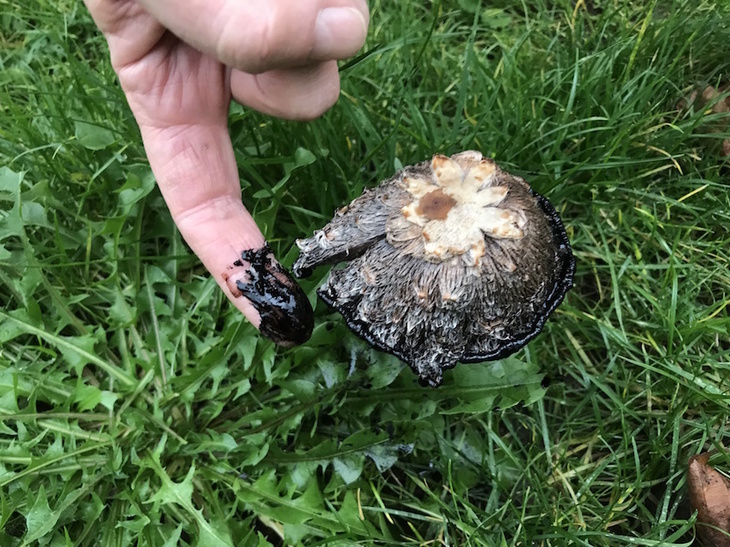 This oozing example was growing on the lawn of a Poplar housing estate. Gilbert is an arboreal magician. There is no twig, bud or crumpled leaf that he can't identify in seconds. His passion for the natural world is infectious. By the half-way point, you'll want to put the book down and hit the streets, armed with a field guide and magnifying glass. The author has plenty of tricks up his sleeve to keep you hooked. One chapter follows a plane tree through every month of the year. Another traces the route of the area's lost river. A third offers a glimpse of post-apocalyptic Poplar, and the catalogue of plants that will out-live the human population. What's true of Poplar is true of the wider city. It's the kind of book that will change your whole perspective on London. No longer will your gaze linger on the buildings, or the people or — heaven forfend — your phone. Once you've read Ghost Trees, you'll marvel at every chance mulberry, and stoop to acknowledge a ragwort's bloom. Poplar does, once again, have a poplar tree. At the book's conclusion, the author joins friends in planting a sapling within the grounds of All Saints church. If it finds the wide audience it deserves, then Ghost Trees will also plant seeds in the imagination, and encourage us all to look again at the natural world within the city. 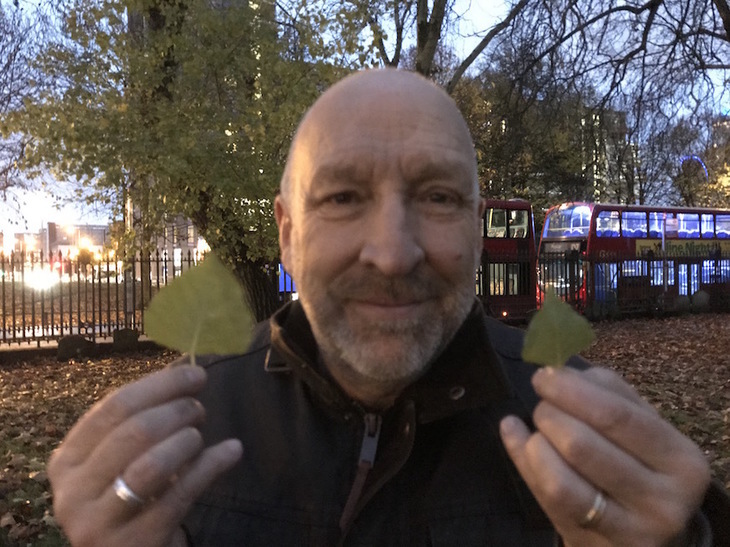 Bob Gilbert demonstrates the difference between a common hybrid poplar leaf (left, flat bottom) and the rarer native poplar (right, pointed bottom). 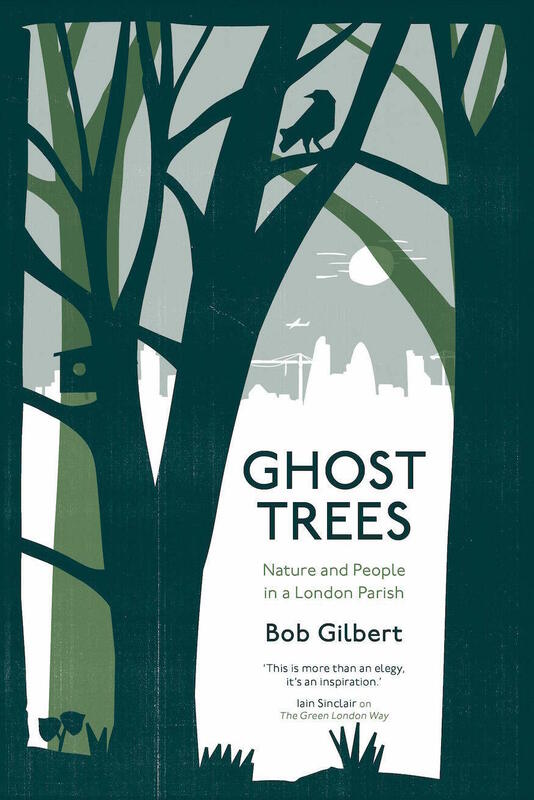 Ghost Trees by Bob Gilbert is out now from Saraband Books. See our map of independent bookshops for local places to get hold of it.